Severn Sailing Association Laser Fleet completed their 2nd Frostbite Series with 9 race days. The 2019 Hangover Regatta was canceled due to gale warnings and unsafe sailing conditions. 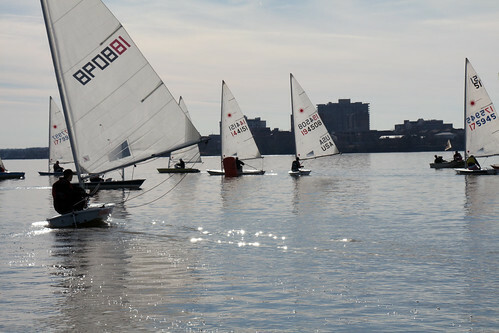 The 2018 District 11 Championship was held at Severn Sailing Association in conjunction with the Crab Claw Regatta. 27 Standards and 16 Radials took to the waters of Annapolis under overcast skies and good wind out of the North. 5 races were sailed on Saturday and David Grace won 2 of them to lead the Standard Fleet while Kim Couranz also won 2 races to lead the Radial fleet. Saturday evening a feast of crabs was prepared and all enjoyed. Sunday saw rainy/misty skies throughout the day and included a little less, but still good wind for sailing. Another 4 races were sailed and David and Kim both sailed well to solidify their lead on their fleets. Big thanks to Scott and Dorian for organizing the event and Steve P as PRO and all of the other folks at SSA who made it happen! award this year with the most races sailed!